Mens White Chino Pants Hampton. These mens white chino pants are a classic staple for clean and fresh style. Crisp white pants finished with traditional chino pant details. Constructed with button and zipper fly, belt loops and five-pocket design with vertical coin pocket. 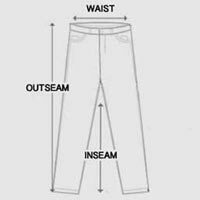 Mens white chino pants are mid-rise with a regular fit that’s relaxed at the ankles. Made from pure cotton fabric with no stretch. White trousers are the perfect pants for elevating your daytime looks with a nautical feel. Stick with the basics in these mens white chino pants. Model is wearing size 34. For accurate measurements, check the table below.